Going away on holiday? Don't get caught out spending all your pocket money on your travel essentials. From airport parking to travel insurance, an Essential Travel voucher can help you make big savings while you shop. So whether you're treating yourself to a romantic weekend away or enjoying a weekend with the girls, use an Essential Travel discount code to stock up on everything you need for a memorable time away. 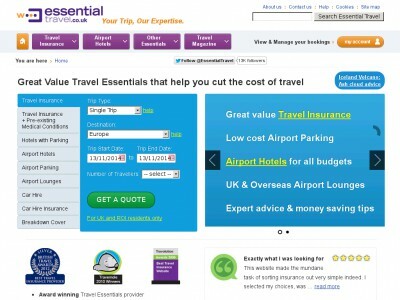 Founded in 2001, Essential Travel is one of the UK's leading independent online travel essentials providers. Bringing everything you need to enjoy a safe, secure and hassle-free holiday together all in one place, Essential Travel helps customers in the UK to make the most of their time away. Part of the popular Holiday Extras group, the company has provided insurance, airport parking, airport lounge access and more to over 5 million customers to date. Heading off on a trip and want to make sure you are covered for all eventualities? Nobody wants to end up sick or injured in a place far away from home, but with comprehensive travel insurance you can make sure that you will be well taken care of should the worst happen. Whether you're off backpacking around the world for a year or just flying to Spain for your annual holiday, Essential Travel offers great value travel insurance that is quick and easy to book. With a range of policies from budget student travel insurance to full cover for the whole family – plus a full online medical screening - you can be sure to get the policy that's right for you. Essential Travel also has great deals on all your other travel essentials. Need to leave your car at the airport? They operate secure parking at all major UK airports, with up to 60% off for customers who pre-book. Want to start your holiday in style? Check out their great deals on luxury airport lounge access. With over 200 executive lounges worldwide and 23 in the UK, these are a great way to relax before your flight and take advantage of excellent facilities and complimentary refreshments. At Essential Travel, you can browse all the lounge options available for your upcoming flight, and book an access package for a great price. Travellers can also use Essential Travel to book rooms in airport hotels, arrange holiday car hire, book tickets for top attractions and much more. With their excellent customer service and commitment to offering fantastic value for money, Essential Travel has won many industry awards including accolades from the British Travel Awards, the Travel Mole Awards and Travolution. The company also maintains a helpful and informative travel blog that's packed full of ideas and inspiration for your next big adventure. Want to get shopping with Essential Travel? With an Essential Travel voucher you can make great savings while you shop. Whether you want a night in a hotel near Gatwick before an early flight or comprehensive travel insurance to cover you if your holiday is cancelled, Essential Travel vouchers will help you save money on everything you need to enjoy a fantastic holiday. Browse our website until you find an Essential Travel discount code that suits you, then navigate to their website to begin shopping. Enter your travel details to find the best deals. Type your Essential travel voucher code in the box provided. Enjoyed shopping for your holiday with Essential Travel voucher codes? Why not hunt down a great deal on a fantastic hotel with lastminute.com or booking.com? Or, if those aren't right for you, you'll find plenty of other stores in our Travel section. Type your Essential Travel voucher in the box provided. Enter your address and payment details and click 'Make payment'. Need to contact the team at Essential Travel? Whether you have a question about your booking, want to find out more about services like airport parking and executive lounges or simply want to find out how you could save money with an Essential Travel voucher, you can contact the Customer Services department by telephoning 0871 360 2720. Want to find out more about the fantastic products and services on offer at Essential Travel? The company maintains a profile across all the major social networks. Follow them for lots of exclusive content including competitions, travel articles and inspiration, industry news and much more. You can also use these pages to find out more about saving money with an Essential Travel voucher. Don’t forget to check them regularly, as you can never be sure when a free Essential Travel might be waiting for you! Buy now online at www.essentialtravel.co.uk. If you’re looking for travel insurance, airport hotels, or car hire, then essentialtravel.co.uk is a one stop shop to get all your travel needs booked. Not only will you find everything you need, but you can use Essential Travel vouchers and Essential Travel promo codes to get the best price possible for your bookings. Redeeming Essential Travel codes is 100% and guarantees the lowest price possible, so be sure to grab your Essential travel voucher codes before you hit the road!